Nestled amid the green hills of Pisa, in the town of San Giuliano Terme, the Bagni di Pisa Palace & Spa is only 6 km from Pisa and 12 km from Lucca far away. The Galileo Galilei airport is only at 12 km from the resort. After a careful restoration of a villa dating back to the eighteenth century, the Bagni di Pisa Palace & Spa is now a luxury hotel that brings to mind the ancient glories of past ages. A thriving Parco degli Ulivi surrounds the Resort, which has been enriched with marble floors and beautiful original frescoes that adorn the elegant hallways. Furnished with antiques and Tuscan terracotta, the classic architecture has been skilfully blended with the comforts of modern life, without losing its ancient essence. The Resort disposes of 61 guest rooms, divided in Comfort, Superior, Deluxe, Junior Suite Prestige, Exclusive Junior Suite and Suite from which you can see in the horizon the fascinating Tower of Pisa. 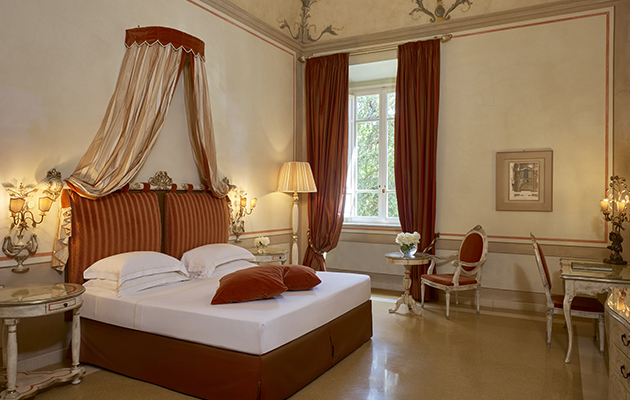 The guest rooms have parquet floors, the frescoed vaults, retractable TV LCD in order to not to spoil the ancient atmosphere, air conditioning, marble floors, are just some of the items that you will find at the Bagni di Pisa Palace & Spa, in a perfect blend of tradition and modernity that will leave you breathless. The Terme Bagni di Pisa were already known to the Etruscans and the Romans, but they became popular among the nobility in 1743 thanks to the Grand Duke of Tuscany, Francesco Stefano Lorena, who made of this his own summer spa residence. The Grand Duke hosted here several prominent figures, and did it soon became a place of social meetings: George IV of England, Gustaf of Sweden, Carlo Goldoni and Vittorio Alfieri are just some of the names that have stayed at this residence and have enjoyed its thermal benefits. The choice is very wide between massages, spa treatments and wellness programs: a meeting among the best of Western and Eastern medicine, together in harmony with the philosophy that guides the Bagni di Pisa Palace & Spa. The restaurant "Dei Lorena", from which we can glimpse at the Piazza dei Mestieri, offers low-calorie vegetarian meals, as well as specialties of the ancient Tuscan tradition. At the bar you can choose an aperitif or a cocktail, to be enjoyed under the magnificent frescoes of the dining room or the rooftop terrace. The stay at Bagni di Pisa Palace & Spa will tickle the curiosity of the visitor, who will undoubtedly deepen the knowledge of this region steeped in history and rich culture and natural beauty. There are numerous possibilities, depending on the tastes and interests of each: from hiking in contact with nature (on foot, on horseback or, more romantically, on carriage), to visiting the marble quarries of Carrara in the footsteps of the master Michelangelo, to wine and food tasting, shopping and much more. Golf lovers will have two fields, 9 and 18 holes at the renowned Golf Club Tirrenia. Not to miss, of course, the visits of the towns of Pisa, Lucca, San Gimignano and Volterra. City tax – of € 2,00 per person/overnight, valid for a maximum of 5 overnights, to be paid on-site. Cozy double bedroom on the ground floor. Characterized by grit floors and the pastel colors. The bathroom has a double sink, hairdryer, bathrobes, shower and separate tub. The Comfort rooms have a wonderful view over the tower, the church and the hills. Large double bedroom with soft colors on the mezzanine of the Hotel. It is equipped with a desk, sofa bed and all modern comforts. The marble bathroom has a double sink, hairdryer, bathrobes, shower and separate tub. The Superior rooms have view on the thermae or hills. Elegant doubler bedroom located on the third floor of the hotel. Decorated with warm colors, it has a cozy sitting area with armchairs and coffee table. The marble bathroom has a double sink, hairdryer, bathrobes, shower and a separate tub. The Deluxe rooms have a wonderful view on the hills or on the garden of the hotel. Fascinating Suite on two levels and featuring an original painted ceiling of 700. The elegant double bedroom, furnished with warm, soothing colors, is located on the loft, while the ground floor is a cozy living room with sofa bed for a third person. The marble bathroom has a double sink, hairdryer, bathrobes, shower and separate tub. The Junior Suite Prestige has an nice view on the courtyard. Bright and spacious suite with beautiful frescoed ceilings. Equipped with all comforts, it has a single large room in pastel colors. The marble bathroom has a double sink, hairdryer, bathrobes, shower and separate tub. The Junior Suites Exclusive overlook the tower or the thermae. Bright and spacious Suite with beautiful frescoed ceilings. Equipped with all comforts, it has a a single large room with a living room with a sofa bed for a third person. The marble bathroom has a double sink, hairdryer, bathrobes, shower and separate tub. The Suites overlook the tower and the thermae.